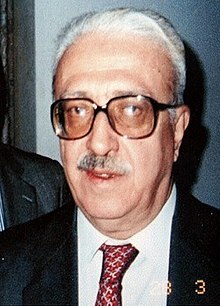 Tariq Aziz (born Mikhail Yuhanna; 28 April 1936 – 5 June 2015) was an Iraqi politician for the Ba'ath Party. He served as the Minister of Foreign Affairs from 24 January 1983 until 22 March 1991. He also served as the Deputy Prime Minister from 1 August 1965 until 9 April 2003. For decades he was a close adviser to Saddam Hussein. Aziz was born in the town of Tel Keppe near Mosul to a Chaldean Catholic family. He studied English at Baghdad University. He later worked as a journalist, before joining the Ba'ath Party in 1957. He was married to Violet Yusef Nobud and had children. Aziz was arrested in 2003 and spent the rest of his life in custody. He died in hospital from a heart attack on 5 June 2015 in Nasiriyah, aged 79. He also suffered from heart disease, depression, diabetes, and ulcers. Wikimedia Commons has media related to Tariq Aziz. ↑ "Tariq Aziz, ex-Saddam Hussein aide, dies after heart attack". BBC. 5 June 2015. Retrieved 5 June 2015. This page was last changed on 14 March 2019, at 22:15.